Panoramic views of the Rub al Khali Desert can be admired from this 4-star resort's infinity pool and sun-lounger terrace. Tilal Liwa offers spacious, well-appointed rooms featuring an Arabian-style decor. All of Tilal's air-conditioned rooms provide views of the garden, pool, or desert. Some rooms are equipped with furnished balconies. Toiletries are available in each bathroom, and rooms include a satellite TV. Local and international cuisine is served at the 2 on-site restaurants. Guests can enjoy a casual atmosphere and garden views at Al Liwan, or watch the chefs prepare their meal in Al Badiya's open kitchen. A brunch on Friday is also available. Guests can enjoy a visit to the steam bath or participate in a desert safari tour. Sand boarding activities are available as well. Tilal's 24-hour reception can organise safari tours to Moreeb Dunes, which has some of the highest dunes in the Middle East. For guests wishing to travel independently, car rental can be arranged. 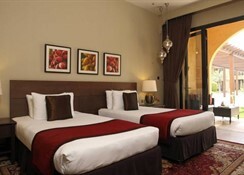 Tilal Liwa Hotel is 20 km from Madinat Zayed. Medium sized lobby, Earliest check-in at 14:00, 2 lifts, Porterage 24 hour, Room service 24 hour, 1 outdoor pool, 2 floors, Gymnasium, Sauna, Baby sitting, Business centre, Disabled facilities. Al Badiya - Al Badiya is an all day dining restaurant which serves international cuisine. Buffet breakfast lunch dinner and A la carte options are also available live cooking stations. It is a non smoking restaurant. Al Liwan - Pool bar besides the pool It opens from 9 am till sunset It serves a wide range of mocktails and beverages Different types of snacks light meals salads are also available Arabic Sheesha is served from 6 pm to 11pm. Al Layali - Layali is a lounge bar located on the lobby level It serves a wide range of mocktails hot cold beverages Resident band will be playing 6 days a week. Room Service - Open 24 hrs of operation can order variety of food liquor menu available in the room. The Tilal Liwa Hotel will conduct its Pool Maintenance from 18th – 24th May 2018. The hotel’s Pool facility will be closed during the mentioned period and Regular Pool Operation starts on 25th May 2018.